Eric grew up in Virginia east of Richmond with a fascination with aviation. Although he started his aviation career later, he attended school at The College of William & Mary in Williamsburg, VA for his bachelor’s degree and Marshall University in Huntington, WV for his master’s degree. Upon returning to Virginia, he began to research opportunities for a career in the aviation industry. In 2010 he started helicopter flight training in northern Virginia at Manassas Regional Airport. 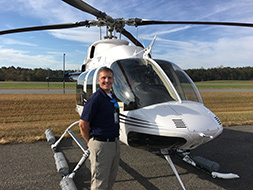 After completing his Certified Flight Instructor-Instrument rating, he became a flight instructor at American Helicopters in Manassas where he taught using Robinson R-22s and R-44s. Eric also performed photo flights, gas pipeline patrol, skydiving flights, and air show demonstrations during his tenure at American. In 2015, Eric had the opportunity to fly Grand Canyon tours in AS-350 A-Stars with Sundance Helicopters in Las Vegas, NV. Eric was offered a position with HeloAir after his tour season, where he performs multiple roles as a pilot for gas pipeline patrol, powerline patrol, video/photo flights, and charters.